One of the great things about being on the fringe of the craft beer industry is you occasionally get exposed to something you might not otherwise have experienced. When it happens, you sometimes realize you had a gap in your knowledge base. I've been consuming craft beer for about 30 years. For 15 or so of those years, I brewed my own beer, which was sometimes pretty good. My tastes have expanded to include a wide range of styles in recent years. Knowledge and hands-on experience can lead you to think you know something about good beer. I have no trouble identifying what I like and don't like in beer. Finding off-flavors and obvious flaws isn't a huge problem. 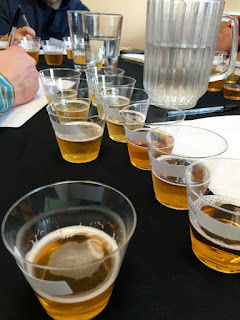 But I never realized how little I knew about beer until I spent a day judging beers with professional brewers and industry-connected folks this past Saturday. It was like wandering in a minefield. 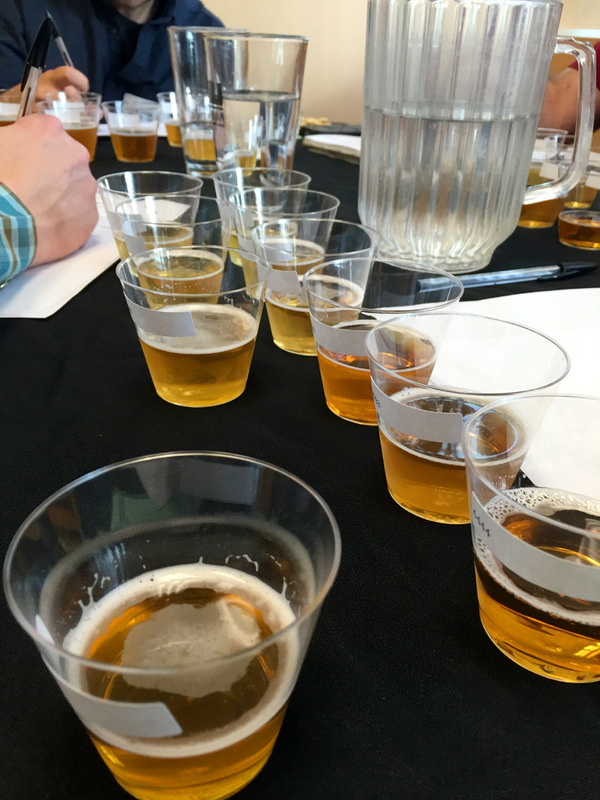 The judging was organized by Willamette Week as part of 2016 Oregon Beer Awards. Something like 50 folks spent two days evaluating more than 500 Oregon beers in a bunch of categories. Winners will be announced at the Oregon Beer Awards in late February. For my part, I was involved in evaluating more than 50 beers in five categories. You might think that's a lot of beer and maybe it is. But sampling is done from small cups and judges almost never drink all the beer from any cup. Contrary to what some think, this isn't a drunk fest. The way it worked is teams of five or six judges convened at tables to evaluate a group of beers of a particular style. Each table had a team captain, someone with significant prior experience in beer judging. Jamie Floyd of Ninkasi, Darron Welch of Pelican and Tonya Cornett of 10 Barrel-Bend led teams I was part of. You know you're in trouble when you look around the table during sampling and see pros making extensive notes on most beers. In front of me, I've got a few thoughts scribbled down, mostly related to flavor profile, obvious flaws, bitterness, color, etc. Uh oh. As the discussion starts, the pros are talking about flaws, some of them very minor, and where they likely came from. What? "The stale character of this beer is likely the result of old malt." Seriously? "That one has a slight veggie profile, probably due to hops stems in the boil." Say what? "I detect a hint of barf in that one." Yuckers. You eventually work your way through the group of beers, identifying the ones with disqualifying flaws and those that are competing to move to the next round of judging. In the end, the group reaches a consensus on the top three. Compromise happens. This ain't Congress. Reflecting on the experience, it occurred to me that this was a little like graduate school. When I reached graduate school eons ago, I figured my undergraduate program prepared me well. Wrong. The grad school learning curve was super steep, just like Saturday. How the pros are able to surmise the origins of good and bad profiles in beer is beyond me. It's pretty amazing to see that in action. I have to say I have a renewed respect for these folks. Big thanks to Breakside's Ben Edmunds for directing the competition and to Willamette Week's Steph Barnhart for organizing. A fine time was had by all, or most. As noted, winners will be announced at the OBA ceremony in February. Be there.